One of the harder parts about owning and operating your small business is separating your emotions out of the decision-making process. Sure, it makes sense to have a passion for what you’re doing, but what tends to get business owners in trouble is when they don’t consider all their options, the consequences of those options, and then choose an option based on how they feel. Granted, the team at Quick Draw Payroll in Medina believes you should feel great about your business, but it takes time to learn how to separate yourself from the business so you can make the best decisions possible for you, your customers, and the future of the brand. In many cases, a business advisor will help you make tough decisions, choose a direction, or even confirm what you were thinking in the first place. Whether you’re struggling to stay afloat or looking to take your business to the next level, a business advisor may be able to help you achieve your goals. Below are a number of benefits we’ve discovered at Quick Draw Payroll when it comes to hiring a business advisor. As diamonds are formed due to pressure, a differing opinion on your situation could bring rise to a new, different, or alternative approach to solving a problem, growing, or changing directions with your business. The core concept to focus on here is not who’s right, but which option will work the best for your business, your customers, and you. In the business world, it pays to have experience. A business advisor, depending on their tenure in any given industry or collection of industries, offers valuable insight on market trends, seasonal dips, and potential pitfalls new business owners may find themselves crawling out of later. Take advantage of a business advisor and ask questions. The goal is to find the best way for your own small business to grow and survive the market. A business advisor will be able to help you navigate the rough waters ahead, whether you encounter them or not. 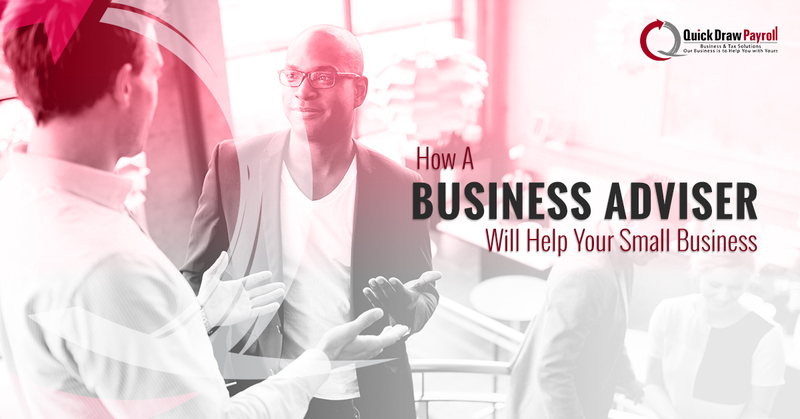 Consider the secondary benefit of hiring a business advisor: You gain access to their entire team, which means a variety of experience to tap into for your own business growth. You may already have a great plan laid out for your business. What if you could take that plan to the next level? A business advisor will be able to take a look at your plan from the 10,000-foot level and see how it applies to the ground level of your day-to-day. The advisor will be able to see holes or catches in your plan and adjust it before you snag these pitfalls and slow your growth. Also, a business advisor will be able to help you create a plan, if you don’t have one already. Not only will you benefit from having a business advisor in your corner, but you will find time saved after the above benefits are taken advantage of. You will have someone with experience watching your back and helping you navigate the business world, which means you can double-down on what you’re good at in your small business. Call Quick Draw Payroll for Business Advisory Services! We’ve served the Medina community with business services for nearly two decades. When it comes to small business accounting, growth, and advising, we can help. Give us a call today to set up a consultation!